Conor McGregor: "I would like to box Floyd Mayweather again"
We are just five days away from the highly anticipated return of one of the UFC’s biggest stars of the 21st century in Conor McGregor as he looks to become a two time UFC lightweight champion when faces off against Khabib Nurmagomedov this Saturday evening at UFC 229. This will undoubtedly be McGregor’s toughest fight of his career, as not only is he facing someone who is stronger than him, but is also facing someone who has the ability to expose his greatest weakness in MMA, grappling. However, in the midst of all of this going on, McGregor apparently seems to be looking ahead towards what is in his future. 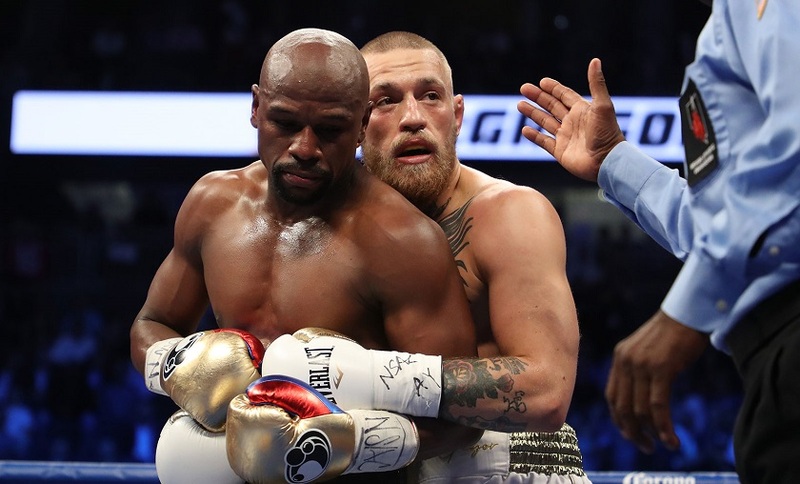 During a recent appearance on Ariel Helwani’s MMA Show, McGregor mentioned of all things, he wanted another chance to box against his arch nemesis in the boxing world, Floyd Mayweather. “I would like to box him again,” McGregor said of another matchup with Mayweather. As we all know, Conor McGregor received a humongous payday following his box office smashing bout with Mayweather in August of last year. Despite the fact it was the Irish bad boy’s 1st ever pro boxing match without ever having a professional fight on his resume, he managed to hold his own against the undefeated legend until he was TKO’ed in the 10th round. Though it was a stellar showcase from McGregor, he’s now back in the UFC/MMA where many people are happy to see him, and he’ll be taking on Khabib Nurmagomedov. Should he defeat the dangerous russian and regain the UFC lightweight championship this weekend, many would like to see a potential meeting between him and fellow former 170/185 pound world champion, Georges St.Pierre. When speaking to Helwani, McGregor stated while he is open to squaring off with the future UFC Hall of Famer, he knows that fight won’t be up next for him in the UFC after the fight with Nurmagomedov. “I don’t think next though,” he said, agreeing to the fact that St.Pierre and himself don’t have any personal problems. Or the fact that the legend doesn’t currently have a belt. McGregor has been adamant as of late about pursuing a 3rd championship in the UFC, be it for Tyron Woodley’s 170 pound belt, or even the rumored 165 pound belt. Regardless of who he faces next, it is definitely something Conor McGregor cares about. “I’m gonna do fights that interest me or that have meaning,” the former double-champ added. Speaking of fights that have interest and meaning to McGregor, a trilogy bout with old foe Nate Diaz is certainly one that would be at the top of his list. Whether that contest will commence at 155, 165, or 170 pounds again nobody knows. One thing that is for sure, Conor McGregor knows the trilogy with Diaz will happen again sooner rather than later.